Since her dad and I are both sick and have been laying around listlessly most of the day, Esme needed a little Mommy time. I decided to sit up for a while and scrap with her, and wanted to do a new layout of us together, just to remind her how much I love her. Some girls over from the peaboard have a new challenge blog, so I thought I would give their first one a go. Esme and I had a nice afternoon together and now I'm back to bed! 2. Love this layout and all of your little speech bubbles!! Love it! Thanks for playing along!! great LO!! i also love your daughters name! great take on our challenge! thanks for playing! Thanks for playing along with us at Handmade Love! 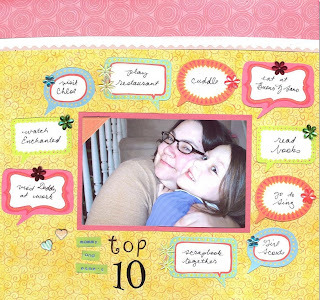 I love the speech bubbles and that it is a layout that you and Esme will look back fondly on someday! Very sweet! Super cute layout, Jenny! Thanks for playing along! !